Defending champion Bishop Miege will look to get back to the 4A-I title game with a road win over Eudora on Friday night. The Stags have gone wire-to-wire as the top ranked team in the state despite a 42-35 loss to Blue Valley back in Week 3. Sophomore quarterback Carter Putz burst onto the scene this season to pass for 2,835 yards and 34 touchdowns with only four interceptions. He has the benefit of an exceptional receiving group led by junior Jafar Armstrong (6-1, 190) who has posted consecutive 1,000-yard receiving seasons. Armstrong has 58 receptions for 1,161 yards and 15 touchdowns this season. In addition to Armstrong, Nolan Gray (6-3, 205) has 40 catches for 656 yards and five scores, while Danny Murphy adds 33 catches for 558 yards and 10 touchdowns. In the backfield the Stags have 2014 all-state selection Dawson Downing (6-0, 205) has rushed for 1,571 yards and 33 touchdowns while averaging nine yards per carry. Sophomore Cameron Clark has added 534 yards and eight scores while picking up 11 yards per attempt. Miege averages an incredible 56.6 points per game while giving up only 16. Defensive lineman Kaelin Key (6-1, 270) leads the team with 60 tackles including 22 for loss and four sacks. The Stags went 3-0 against Frontier League competition this season outscoring Spring Hill, Louisburg, and Paola by an average score of 58-11. Frontier League member Eudora will try and slow down the powerful Stags and keep the ball away from the Miege offense using a ball-control rushing attack. Quarterback Grant Elston leads the Cardinals with 2,062 rushing yards and 31 touchdowns on the season. Elston rushed for 318 yards and four touchdowns last week as the Cardinals survived a furious comeback by Basehor-Linwood to advance, 60-59 in double overtime. Eudora led Basehor-Linwood 47-28 in the fourth quarter before the Bobcats scored, recovered the onside kick, and scored again to pull within 47-41. Eudora drove to the Basehor-Linwood 2-yard line before turning it over on downs leaving the Bobcats facing a six-point deficit and 98 yards to go in 1:20 without a timeout. Bashor-Linwood responded as Justin Phillips hit Eric Scott on a 24-yard touchdown pass with 3 second remaining to tie the game at 47. A bad snap on the PAT send the game into overtime. Both teams scored in the first overtime and each blocked the others’ PAT. In the second overtime, Basehor-Linwood took a 59-53 lead and elected to go for the two-point conversion after failing to convert their last two PATs. The Bobcats could not convert the two-point attempt and Eudora responded with a score and PAT to win. Austin Downing contributed 195 rushing yards and five touchdowns for Eudora in the win. Eudora will likely have to play keep-away, avoid turnovers, and create some turnovers for their offense. Miege is very explosive and will be difficult for the Cardinals to contain. In Week 7, Topeka Hayden traveled to Andover Central, controlled the clock against the Jaguars’ high-powered offense, and won 38-29. Five weeks later, Andover Central again plays host to Hayden. Both teams survived great quarterfinal tests versus standout programs. Hayden, in another playoff matchup with Buhler, defeated the Crusaders, 17-14. Patrick Ellrich kicked a 29-yard field goal with five seconds left for the victory after a Buhler fumbled punt. Connor Schumacher collected 76 rushing yards and a touchdown, and Dallas Crittenden passed for 95 yards and a score. Andover Central eked past Abilene, 35-34. Andover Central led 27-7 before the Cowboys made a big comeback. Abilene scored off a halfback pass with 1:46 remaining and then missed the extra point. The Jaguars were a Kpreps’ preseason selection for a 4A-I breakout team. They have enjoyed a three-win improvement and advanced to the sub-state championship for the first time in school history. Before this season, Andover Central had made the quarterfinals twice, in 2006 and ’14. Hayden is now tied for fifth all-time in Kansas state history in playoff victories with 51. The Wildcats, defending state runners-up, are 3-3 all-time in state games and now have six other semifinal appearances. 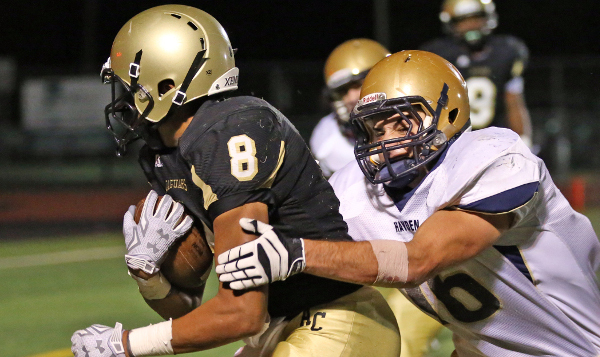 Andover Central has a prolific offense that’s one of Kansas’ most efficient units. Senior quarterback Peyton Huslig has completed 93 of 158 passes for 1,865 yards with 28 scores against five interceptions. Senior Jordan Birch has 261 carries for 1549 yards with 17 touchdowns. The Jaguars average 22 yards a completion, including 44 catches for 1,240 receiving yards and 20 receiving touchdowns from senior Darraja Parnell. A returning all-state defensive back, Parnell paces the squad with four interceptions and 122 interception return yards. Andover Central averages 7.6 yards per play. Against Hayden, the Jags averaged 7.4 yards per play, but had just 39 snaps, well below its season average. Hayden collected 80 snaps. Hayden is 3-0 all-time against Andover Central. Schumacher paces Hayden with 112 carries for 941 yards and 13 rushing scores, while Daniel Gaito has 131 carries for 721 yards and nine rushing scores. Crittenden has completed 107 of 177 passes for 1,281 yards with 13 scores versus four interceptions. Hayden averages 5.9 yards per play with 56 snaps a contest. Hayden is a seven-point favorite by Prep Power Index. Last week, favorites from 5A to eight-man went 22-2. There’s going to be at least one upset Friday. It’s going to be difficult for Hayden to run twice as many plays as Andover Central on the road again. The Jags’ great offense pulls the upset.